Members of the Grand American Classification Committee are (front row, L to R): David Rhodes (CHC - SW), Garry Hill (Assist. ), Kathy Key (ATA Staff), Dean Townsend (CHC - Chairman). (Back row, L to R): Bob Felber (CHC - Central), Dan McKenzie (CHC - Western), Ray Greb (CHC - Eastern), WM (Billy) Cook (Assist. ), Dan Ryan (CHC - Southern). The members of the Central Handicap Committee will be running the classification at all Satellite Grands and other major ATA events. This month’s article is dedicated to the very first thing you are required to do when attending a major ATA-registered tournament: classification. While this may not seem like the most interesting topic for discussion, I assure you it is one of the most important. As a 26-year member of the ATA Central Handicap Committee and a six-year member of the ATA Rules Committee, the past few years I have witnessed a disturbing trend in the increase of handicap score disqualifications. In ALL cases, these disqualifications were the result of shooters being unaware of the rules regarding registered handicap shooting and, as a result, shooting from an incorrect yardage. This article is designed to inform shooters of some very basic rules and some very basic actions they can take to avoid these handicap classification pitfalls. Also, don’t think it is always new members or youth shooters shooting the wrong yardage. Many disqualifications have been from multi-year members who were just careless about their score records and their subsequent misclassification. 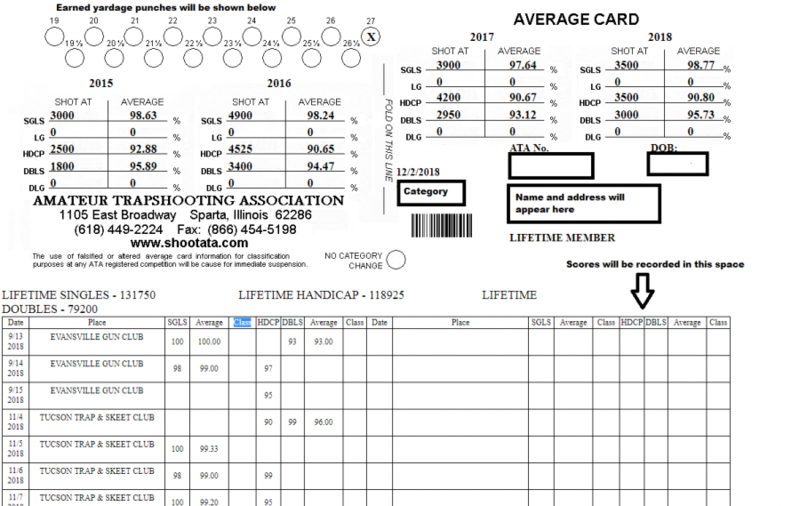 The bottom line…it is the DUTY of each shooter to make sure their average card reflects the current, singles and doubles averages and their current yardage (see Rule VI.D.9 which can be found in the middle of page 23). On a separate note, the ATA just granted gun clubs permission to post earned yardage on their club’s website. While it is not the club’s responsibility to do this, many want to do it anyway as a shooter service. If you must leave before the handicap is over, and you think your score may qualify for earned yardage, ask the club manager if they post earned yardage on their website. To begin, let’s talk about some important things you can do before ever stepping up to the classification counter. By far, the easiest thing you can do is carry an ATA classification card. You can download this from the ATA website at www.shootata.com. If you don’t have a password to access the website, call the ATA office in Sparta (618-449-2224) and have one of the staff members issue you one (see Fig. 1). This card is important because it gives you the ability to have your averages in singles and doubles up to date, relative to the moment you step up to the counter. Also, the average card has information about your category and your current yardage. All of this information is critical to the person doing the classification at the tournament. The card is an excellent starting point in allowing that person to classify you correctly. For example, when the classifier is looking up your records on the ATA website or club score database (downloaded from the ATA), the card you present serves as the first alert to that person if something is wrong. If your card is up to date with averages and correct yardage punches (or reductions), it is the BEST insurance you can possibly have towards getting your classification correct. Did you know there is actually an ATA rule that mandates all shooters keep an average card? It can be found in the current rule book (see section IV.G.1 - bottom of page 12). Even though this rule may be lightly enforced at the classification table, there is a major club in the Eastern Zone that REQUIRES you present your average card at the time of classification. It is the only club I know of that is proactively trying to ensure the shooter’s classification is correct. Having read all of this, I’m sure some of you are probably thinking all of this carrying and keeping an average card business is just silly. After all, you can access the ATA website to get your scores on a smartphone. While this is true, you need to understand one important flaw in this plan. The ATA does not currently employ instant score reporting. Our system is not the same as when you use a bank card and, within a few seconds, your transaction is recorded somewhere on a website you can look up. By rule, the ATA currently allows gun clubs up to eight days to send in a shoot report, either by snail mail or electronically. It can then take up to a day or two to enter your scores into the database at the ATA office. Therefore, your ATA website scores, being viewed on a smartphone, are likely going to be about a week out of date. And, since many clubs that host larger tournaments download classification data from the ATA website up to a week in advance of their tournament, it is also likely these scores being used by classification will almost certainly be up to ten days to two weeks out of date when you step up to the classification counter. This is why carrying an average card that is current on your scores and earned yardage virtually eliminates this pitfall. In my experience, relying on the ATA database as the only source of information to determine your classification is the number one cause of handicap disqualification. This is especially true for AIM youth shooters. Another pitfall for your group is pre-classification. Many times your coach/advisor is required to send in your ATA number four to six weeks in advance of the tournament so your teams can pre-squad. In most cases, in order to pre-squad you have to first be pre-classified. Again, if you are shooting a lot of registered targets, this classification is likely going to be extremely out of date by the time you get to the tournament. To avoid this pitfall, my advice to all AIM shooters and coaches is to take your ATA card through classification before you enter your first handicap event. In the last two years at the AIM championships in Sparta, I can think of at least seven or more instances where scores were disqualified due to incorrect yardage information that was not up to date. It’s just good insurance to keep an average card (or download a current one) and present it to classification personnel before you enter an event in that tournament. This will ensure your class, category and yardage are correct at the time of classification. Believe me, NOBODY likes to disqualify a score. Remember two things: First, by rule, it is your responsibility to make sure your averages and yardage are current (VI.D.9 – p.23). If there is any mistake made in your classification, it is on YOU!! Second, if you are misclassified because the yardage is wrong, and you shoot from an incorrect yardage, your score will be disqualified (rule XII.B.1.d & e – middle of page 39). Therefore, KNOW WHERE YOU STAND and shoot from that yardage! Also, if you are an AIM shooter, don’t let your coach/advisor tell you to shoot from a different yardage just because the rest of the squad is shooting from that yardage! The last couple of years I’ve seen winning AIM handicap scores disqualified for this very reason. It’s often because your coach/advisor is new to our sport and doesn’t fully understand the importance of shooting from the correct yardage. Another issue I have been witness to is a shooter who earns yardage at a shoot just prior to being issued a review/reduction card. Remember, your score from the club could take over a week to arrive and get processed. The chances of a reduction being posted online or issued to you BEFORE your scores are processed at the office is not all that unreasonable. If this occurs, when the earned yardage does get entered into the ATA database, the computer will effectively “zero out” the earned yardage because the reduction has already been posted. I have seen a few MAJOR wins at the Grand American disqualified for this very reason, including a big one last August. The rules are quite clear on this subject (see Rule VI.F.6 – middle of page 24). By rule, you cannot receive a reduction unless you shoot at least 1,000 handicap and 500 singles targets following earning yardage. Remember, the rule book clearly states it is the DUTY of the shooters to make sure their yardage is correct. Again, a current average card, punched to the correct yardage, would easily prevent this pitfall. In summary, let me leave you with four important recommendations for your consideration. READ THE RULE BOOK!! I would recommend any new shooter or AIM coach/advisor read very carefully sections V & VI (pages 18-25). 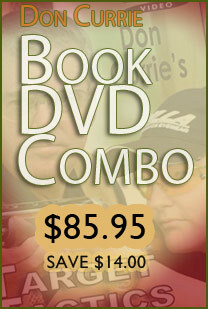 Consider carrying a copy of the ATA rule book in your shooting bag as well. This read is a MUST for any and all AIM coaches. This year the ATA is going to actively promote youth handicap events through the AIM program. Again, keep track of your earned yardage and KNOW WHERE YOU STAND! Print an ATA average card (see Fig. 1) from the website www.shootata.com. Keep your scores up to date, especially the earned yardage. Put your card in your shooting bag or gun case and bring it with you to the classification table. Remember, it is one of the best ways to ensure the classifier gets your classification correct before you enter a major tournament. Dean Townsend attended his first Grand American in August of 1968. 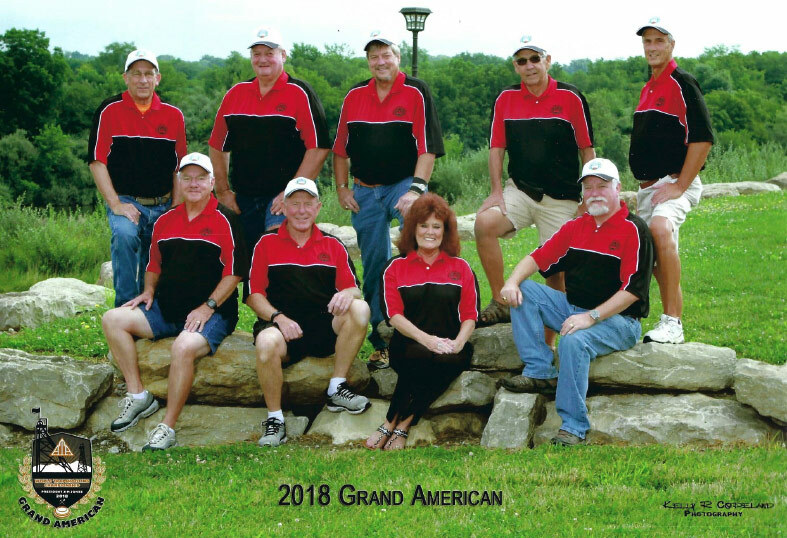 In August 2018, he attended his 51st Grand American. He shot his first Grand American in 1970 at 12 years of age. He currently holds five state titles in his home state of Ohio and has been named to over 20 All-Ohio state teams. He has also served two terms as a member of the Ohio Trapshooting Board of Directors, as well as two years as Ohio ATA delegate; been a member of eight different ATA All-American teams including: Sub-Jr, Men’s second team and both 1st and 2nd Sub-vet teams. In 1993 he was appointed to the ATA Central Handicap Committee by then President Jim Bradford. He served in that position for 17 years until 2010. At that time, he was asked to serve as Chairman of that committee, a position he currently holds. He is also a six-year member of the ATA Rules Committee. During the past four years, he has been a member of Blaser-USA's pro-staff, assisting with customer service issues and helping shooters set up demo guns at several major tournaments around the country. He retired after 35 years of teaching high school and college chemistry in May of 2015.